Identification. Arab traders who made their way down the East African coast mingled with African peoples, creating a hybrid culture and language called Swahili. This culture still predominates in several East African countries and exerts a strong influence in northern Mozambique. The name "Mozambique" is thought to come from the Swahili Musa al Big, the name of an ancient Arab sheikh, ("chief") who lived on the northern Ilha de Moçambique. Location and Geography. Mozambique is on the southeastern coast of Africa, bordering Tanzania, Malawi, and Zambia to the north; Zimbabwe to the west; South Africa and Swaziland to the south; and the Mozambique Channel to the east. The capital, Maputo, is in the south, near the coast. The area of the country is 308,642 square miles (799,509 square kilometers). The terrain ranges from rain forests and swamps to mountains, grasslands, sand dunes, and beaches. The Zambezi River is an important natural resource, supplying power through the Cahora Bassa dam, one of Africa's largest hydroelectric projects. The Zambezi flows west to east and cuts the country into northern and southern regions that diverge, to some extent, in terms of culture and history as well as climate. There are two main seasons: the wet season from November through March and the dry season from April through October. Drought is common, particularly in the south. However, the country also has experienced devastating floods, most recently in 1999. Mozambique a great diversity of animal life, including zebras, water buffalo, elephants, giraffes, lions, hippopotami, and crocodiles. The country has established national parks and game reserves where these animals are protected. Demography. The estimated population in 1998 was 18,641,469. This figure represents a twofold increase since 1970. Mozambique once had the highest growth rate in southern Africa, but the rate of increase declined significantly from the mid-1970s through the 1990s as civil war caused losses from both death and emigration. There are about 1.1 million Mozambicans in Malawi and Zimbabwe. More than two-fifths of the population is under the age of fifteen. The population is divided among roughly sixty different ethnic groups, including nine major ones. The largest group is the Makua-Lomwe in the north, who account for about half the population. Farther north are the Makonde near the coast and the Yao near Lake Malawi. Southern tribes include the Tsonga, the Karanga, the Chopi, the Shona, and the Nguni. Roughly 3 percent of the population is European, Indian, Chinese, Pakistani, or mestizo (mixed African and European). These people are concentrated in the coastal cities and usually work as doctors, teachers, shopkeepers, or industrial laborers. Linguistic Affiliation. The official language is Portuguese, a legacy of the country's colonizers. When Mozambique gained independence in 1975, Frelimo wanted to evict the colonial language but was not successful in finding a replacement. No other language is spoken by a majority. In the north, the Bantu languages of Yao and Makua predominate; in the Zambezi Valley, it is Nyanja is the dominant languages; and in the south, Tsonga is spoken. Along the northern coast, many people speak Swahili. Portuguese is the language of education and government but is rarely spoken outside the cities. Because six of the neighboring countries are former British colonies, English is used occasionally, particularly in Maputo, in dealings with businesspeople and tourists from South Africa. left border. In the center is a yellow star overlaid with a book, symbolizing education; a hoe, symbolizing agriculture; and a rifle, which stands for defense and vigilance. Emergence of the Nation. The earliest inhabitants were small groups of hunters and gatherers such as the Khoi and the San. These groups were part of what is known as the Bushmen. These nomadic people eventually moved out or intermarried with Bantu-speaking tribes that came to the area around the third century C.E. In the eighth century, Arab traders began establishing trading posts along the coast. By the fourteenth century, those settlements had developed into independent city-states and were the main political and commercial centers in the area. The Portuguese explorer Vasco da Gama was the first European to reach current-day Mozambique. When he arrived in 1498, the Maravi kingdom of the Mwene Matapa was in control of the central Zambezi Basin. Da Gama first landed in the Muslim island town of Moçambique, and by 1510 the Portuguese controlled trading from Sofala in present-day Mozambique north to Mogadishu in what is now Somalia. In 1515, they began to expand their explorations into the interior with the intention of further controlling trade and taking control of gold mines. They subdued the inhabitants and over the next century claimed rights to vast areas of land and to the people who lived there, whom they forced to work on their farms and in their gold mines. The Mwene Matapa recognized Portuguese rule in 1629. The Portuguese called the area Terra da Boa Gente ("Country of the Good People"). Portuguese rule was challenged by local landlords ( prazeiros ), who wanted power for themselves, and by fighting among the African tribes they were trying to subdue. In the late seventeenth century, the Rozwi kingdom defeated the Mwene Matapa and forced the Portuguese south of the Zambezi River. Portuguese supremacy continued to wane until the end of the eighteenth century, when Portuguese seized control of the port at Delagoa Bay in the south, later named Lourenço Marcos (today Maputo, the capital). In 1752, the first colonial governor was appointed. Slavery existed in the area before the Portuguese came, but they introduced the concept of exporting slaves, and by 1790 nine thousand people were being shipped out each year. The slave trade took the healthiest young people, sapping many cultures of their vitality and growth. In the early 1800s, when the British began to pass laws against the slave trade in West Africa, this opened new opportunities for it to grow along the eastern coast of the continent. Even after the Portuguese outlawed slavery in 1878, it went on for many years. The Zulu presented another challenge to Portuguese rule. Under the leadership of the warrior Shaka, the Zulu tribe expanded its domain by attacking villages throughout southern Africa. The Zulu also battled the Portuguese, capturing the fort at Lourenço Marcos in 1833. European colonizers in nearby territories refused to recognize the Portuguese claim to Mozambique. The British in particular contested several areas in the south of the colony and actively ruled the areas to which they laid claim. In 1875, this dispute erupted into a major conflict that was settled in Portugal's favor. A conference was held in 1885–1886 in Berlin in an attempt to divide the African continent peacefully among the European colonizers. Portugal claimed a territory that stretched from Angola on the west coast to Mozambique in the east. The British did not agree to this, and boundary wars were fought until Portugal relinquished Mashonaland, part of current-day Zimbabwe, in 1891. The Portuguese also had to subdue the African inhabitants of their colony, which was particularly difficult in the interior Zambezi region and the north. In the late 1800s, Portugal chartered private companies to oversee inland territories, superseding the power of the local landlords. In 1907, in an attempt to consolidate and enforce its power and to combat local corruption, Portugal moved the administration of Mozambique from Lisbon to offices in the colony itself. During World War I, Portugal conscripted thousands of Mozambican men to fight for the Allies; this resulted in a violent uprising in 1917. More than 130,000 Mozambicans died in the war. With the establishment of the Colonial Act in 1930, Mozambique's limited autonomy was replaced by a more centralized Portuguese administration. In 1951, Portugal declared the colony an overseas province. Throughout the 1950s, the Portuguese government attempted to increase the white population. This, combined with atrocious treatment of the African population led to a steady migration out of Mozambique to the neighboring countries. secret police suppressed the actions of the political organizers, who were forced to work in nearby African nations. In 1962, exiled leaders in Tanzania established Frelimo, the Frente de Libertação de Moçambique (the Mozambican Liberation Front). Frelimo, lead by Eduardo Mondlane, was strongest militarily in the north, from where it drew most of its guerrilla fighters. Fighting between Frelimo and Portuguese troops broke out in 1964, after which Portugal sent more than seventy thousand troops to subdue the uprising. However, it was a costly war, and when Portuguese army officers revolted in the mid-1970s, the colonial government collapsed. Mozambique gained independence on 25 June 1975. With the beginning of the independence movement, many Portuguese fled the country, and the white population fell from 200,000 to 30,000 in 1977. Frelimo was declared the new ruler and established a government based on Marxist-Leninist ideology. However, conflict within Frelimo's leadership, both political and ethnic, was widespread. That conflict had already led to violence, including the assassination of Mondlane in the late 1960s. Frelimo also faced external opposition, most notably from the rebel group called Renamo the (Mozambican National Resistance). The ongoing civil war that resulted disrupted Mozambique's economy, caused tens of thousands of deaths, and forced large numbers of people out of their homes and villages. In the late 1980s, Frelimo, under pressure from the International Monetary Fund, renounced its Marxist stance in order to receive foreign aid. In 1990, a new constitution was introduced that allowed for a multiparty democracy. On 4 October 1992, the civil war officially ended when a peace accord was signed by Frelimo and Renamo leaders. National Identity. The country is divided along both ethnic and linguistic lines. Mozambicans often identify primarily with a tribe and/or linguistic group. However, the independence movement that began in the 1960s was a unifying force, causing these disparate elements to join together in resisting the Portuguese. Ironically, some of the main unifying factors in the country have been remnants of the colonial system, including the Portuguese language and the Roman Catholic religion. This is most evident in the central Zambezi Valley, where Portuguese influence was strongest. Ethnic Relations. Despite ethnic and linguistic differences, there is little conflict among the various groups. The greatest cultural disparities are those which divide the north of the country from the south. The groups north of the Zambezi follow a system of matrilineal descent. Many of them are seminomadic, moving every few years to more fertile soil. Because they are far from the capital and other urban centers, these northern groups show less influence from the Portuguese. South of the river, in the Zambezi Valley, the people adopted Portuguese dress, language, and religion to a larger extent. All the main cities are located on the coast. Maputo was constructed on a European model and has wide streets, public gardens, and paved sidewalks inlaid with mosaic tiles. The city has two parts: the older residential area on a cliff overlooking the harbor and the newer industrial area below, where the factories, port facilities, and most office buildings are located. In the 1950s, the Portuguese architect Amancio d'Alpoim Guedes designed many of the city's office and apartment buildings, which combine shapes and symbols from traditional African art with a modern sensibility. Aerial view of the capital city Maputo. It was constructed with wide streets, public gardens, and paved sidewalks inlaid with mosaics. Most of the cities took in a large number of refugees from the countryside during the civil war. To cope with that sudden population increase, shantytowns were erected along the outskirts. Poor sanitation in those settlements led to the spread of disease. Government planners have been attempting to combat this problem by building low-cost apartments, but they have been unable to keep up with the growing population. Beira, the second largest city, is primarily a port. Located several hundred miles north of Maputo, on the coast, it is the center of the commercial fishing industry and a center of trade with Malawi and Zimbabwe. Like Maputo, it took in a large number of refugees during the civil war. It is also a Portuguese-style colonial city. Nampula in the north is the third largest city and was established in the late 1960s when the Portuguese drained a swamp and built it. The city grew even more rapidly than expected, partly as a result of its location along the commercial railway between Malawi and the port of Nacala. However, despite its harbor and modern facilities, Nampula has declined in importance because of the deterioration of the railroad line that leads from the city to the interior and to Malawi. The oldest surviving settlement is Moçambique Island in the north. The Arab architecture of the twelfth and thirteenth centuries, including coral-block mosques and houses, is still standing. Fort Saint Sebastian, a huge stone fort built by the Portuguese in 1507, is another physical testament to the island's history. The fort has been preserved as a museum. The town continues to thrive with large Asian and Muslim populations. The country also has the remains of several ancient cities, including Nhacangara near the border with Zimbabwe. This site has a stone fortress with paths and tunnels, and traces of terraces on the nearby hills indicate earlier settlement. Archaeologists speculate that the country has many more long-uninhabited cities that have not been discovered. However, research into them has been impeded by the civil war. Much historic colonial architecture was destroyed in the civil war. Renamo's strategy was to destroy every building that Frelimo erected. That destruction extended to include even small structures in the countryside, until the whole country was virtually destroyed. Despite the rapid growth of the cities, nine-tenths of the population is rural. Traditional village houses are round huts made of poles held together with mud, and thatched roofs made of palm leaves. However, most homes built today are made of cement blocks and have tin roofs. Each village erects a boma around its perimeter. This is a fence with sharpened posts, that provides protection against attacks by lions and other wild animals. The fields lie outside the boma. Villages are centered on a cattle pen called a kraal, or a community building. Food in Daily Life. Most of the crops originally cultivated in the region have been supplanted by European imports. The exception is millet, a grain that sometimes is made into beer. The diet of rural residents is based on the cassava root, which is called mandioca in Portuguese. Its importance is testified to by its name, which translates as "the all-sufficient." This malleable food source can be baked, dried in the sun, or mashed with water to form a porridge. In its most common form, it is ground into a coarse flour along with corn and then mixed with cassava leaves and water. The resulting dough is served in calabashes. Corn is the other staple food; both corn and cassava were introduced from the Americas by the Portuguese. Cashews, pineapple, and peanuts, which are other important foods, found their way to Mozambique in the same way. Along the coast, the cuisine is more varied and Portuguese-influenced than it is in inland areas. The diet there includes more fruit and rice as well as seafood dishes such as macaza (grilled shellfish kabobs), bacalhão (dried salted cod) and chocos (squid cooked in its own ink). Food is seasoned with peppers, onions, and coconut. Palm wine ( shema ) is a popular drink. Food Customs at Ceremonial Occasions. Food is a part of many celebrations. It is customary to serve a meal at parties, rituals, and other social gatherings. For the poor (who are the vast majority of the population), while ceremonial occasions often entail large feasts, the food served is the same as what is eaten everyday. Basic Economy. The gross national product has nearly no growth rate and is one of the lowest in the world. Although only 5 percent of the land is arable, 80 percent of the people work in agriculture. The farming techniques are primitive, involving few tools and work animals. After independence, many farms were organized on the basis of Chinese and Cuban models; however, with the changes imposed by the International Monetary Fund in the late 1980s, a system of decentralization and private ownership was introduced. The main crops cultivated are corn, cassava, coconuts, peanuts, cotton, sugar, and cashews. However, the nation cannot meet its food needs, particularly for corn, and must import large quantities of food. Mozambique's currency is the metical . Land Tenure and Property. There is no tradition of private land ownership. Land belongs to the community rather than to any individual. When the country won independence, the socialist Frelimo government took over ownership of all the land from the Portuguese and encouraged villagers to farm collectively, according to their traditions. Commercial Activities. The main goods produced for sale within the country are agricultural. Farmers grow corn, cassava, peanuts, bananas, and citrus fruits for their own consumption. Some of these products are sold at local markets, and some are transported to the capital and other cities for sale there. Major Industries. Agriculture is by far the largest industry. Fishing along the coast (particularly shrimp) accounts for one-third of the country's exports. The rivers also provide fish, and there are several fisheries that produce mackerel, anchovies, and prawns. Mining and manufacturing account for one-fifth of the gross domestic product. The principal products are coal, beryllium, limestone, and salt. There are also deposits of tantalite, iron ore, uranium, copper, gold, and diamonds. The country also manufactures textiles, plastics, beverages, food, cement, glass, and asbestos. Trade. The main exports are shrimp, cashews, cotton, sugar, and timber, which go primarily to Spain, the United States, Japan, and Portugal. Imports of food, machinery, petroleum, and consumer goods come from South Africa, the United States, Portugal, and Italy. The country has an unfavorable trade balance, although it is alleviated somewhat by remittances sent by Mozambicans working in South Africa. Division of Labor. The workforce is divided primarily along geographic lines. The majority of the population is rural, and these people are farmers. In cities, there are more skilled workers as well as street vendors and a small white-collar workforce. Professionals such as teachers, lawyers, and government officials constitute a small percentage of the population and generally come from a small number of middle-class or wealthy families. Supporters turn out at an election rally in Chokwe, Mozambique. Citizens enjoy universal suffrage. Classes and Castes. During the time of Portuguese rule, the prazeiros, (Portuguese landowners) formed the wealthiest and most powerful class. Below them were the mestizos, those of mixed African and Portuguese descent; and at the bottom were Africans, who constituted the vast majority of the population. Despite the internal diversity of the population, which is composed of various cultural and linguistic groups, ethnicity has never been a major factor in social status. Since independence, most Portuguese have left the country. Today, with the exception of the tiny ruling elite, nearly everyone in the country is poor. Symbols of Social Stratification. The way people dress reflects the confluence of different cultures as well as the individual's economic standing. In the cities, men wear Western-style suits to go to work. Women wear Western-style dresses made from fabric with brightly colored African patterns. Throughout the country men have, for the most part, replaced the traditional loincloth with T-shirts and dashikis. Women in rural areas, however, generally have kept their traditional garb of long strips of fabric that are wrapped around the body, under the arms, and over one shoulder. They also have retained the traditional head scarf or turban. Young people almost exclusively wear Western clothing, except for the extremely indigent. Despite the European and American influence on fashion, some styles, such as blue jeans and short skirts, have not been adopted. Dress also can be a marker of ethnic identity. Muslims in the north wear traditional long white robes and head coverings; Asian men wear white two-piece cotton suits, whereas Asian women dress in black or colored silk dresses. Language also can be an indicator of socioeconomic standing. Portuguese is learned in school and is therefore the language of the privileged elite; it is almost entirely unheard outside the cities. Government. The constitution adopted in 1990 declared Mozambique a multiparty democratic republic. The 250 members of the unicameral Assembly of the Republic are elected by universal suffrage. The president is both chief of state and head of the government and is elected for a five-year term, with a maximum limit of three terms. Leadership and Political Officials. While Mozambique is officially a multiparty democracy, the government is still dominated by the two main parties, Frelimo and Renamo. The third party, which did not win any seats in the legislature in the 1999 elections, is called the Democratic Union. Frelimo, the ruling political party from independence through the end of the civil war, suffered from infighting among its leaders. Both Frelimo and Renamo took their leaders from workers in the independence movement. While there are varying levels of education among politicians, almost all have studied abroad in Portugal or other European countries. Social Problems and Control. Crime is a growing problem, particularly in the cities, which have been flooded with poor unemployed men from the countryside seeking work. The justice system was fashioned after the Portuguese model. However, without enough qualified judges and lawyers, this system could not function well, so Frelimo modified it. Because prison facilities could not accommodate the large number of criminals, the government established rehabilitation camps (usually farms) for minor offenders and alcoholics (Frelimo considered alcoholism a crime). Frelimo also set up vigilante groups of citizens to turn in alcoholics and anti-government individuals. One of the most pressing problems is human rights violations on the part of law enforcement agents, and the mistreatment of criminals and suspects. Military Activity. Under Frelimo, the police force was nationally controlled, with local divisions in each town. Frelimo also put in place the National Service of Popular Security, an arm of the police force that deals with terrorism and sabotage. When peace accords were signed in 1992, Frelimo had an estimated seventy thousand troops and Renamo had twenty thousand. Those fighters were compelled to turn in their weapons, and a new national force, the Mozambican Defense Force, was established, including fifteen thousand men from each party. Social welfare comes primarily from within the family, which cares independently for its own elderly or ailing member. Other aid comes from international charitable organizations. 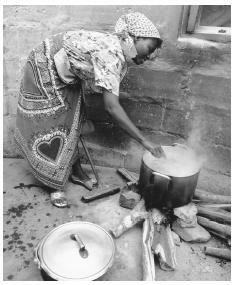 A woman cooks over an open-air fire in Mozambique. Women often face obstacles when seeking nontraditional employment. and rebuilding of the armies, over the 1994 elections to ensure that they were fair and democratic, and helped return almost two million refugees to their homes. As part of the last project, the United Nations aided in the reconstruction of water systems, roads, schools, and clinics. The International Organization for Migration (IOM) also helped with the repatriation process. One of the biggest problems is the presence of land mines left over from the civil war. It is estimated that up to two million were buried. The United Nations collaborated with USAID and a Norwegian group to help find and defuse them. The refugee situation has created another crisis in the form of legions of abandoned street children, particularly in Maputo, where they number an estimated half a million. Many volunteer aid organizations work with orphans and abandoned children to care for them and educate them to be self-sufficient. Among these groups are Save the Children and the Institute for International Cooperation and Development (IICD). The World Food Program buys grain grown in areas of the country where production exceeds use and redistributes it in other areas. Division of Labor by Gender. The constitution guarantees all citizens the right to work, but women often face obstacles when they seek nontraditional employment. Women have historically been responsible for all domestic tasks. In the towns and cities, they generally are confined to the home, whereas in rural areas, they play an important role in the agricultural labor force. The Organizaçao de Mulheres de Mozambique (Organization of Mozambican Women, or OMM), which works to promote women's rights, has implemented programs to teach women to sew and crochet and sell the products they produce for cash. The Relative Status of Women and Men. According to the constitution, men and women have equal rights. However, both traditional and colonial attitudes keep women in a somewhat subordinate position. 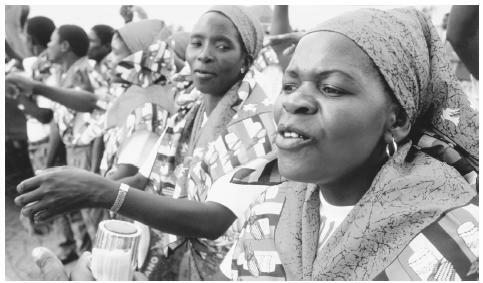 Even within the ranks of Frelimo, which declared itself a proponent of women's rights, women have not attained positions of power. Marriage. Polygamy is traditionally practiced and until recently was quite common. In 1981, Frelimo instituted a law designed in conjunction with OMM that established monogamous marriage, and by which both spouses share ownership of property and decisions about where to live. The law also entitled women to a means of maintenance and specified the responsibilities of fathers in financially supporting their children. Marriage celebrations involve feasting, music, and dancing. Domestic Unit. The traditional family includes several generations living together under one roof. However, in many areas, this family structure has been dismantled by the civil war, which took many lives, compelled many men to emigrate from rural areas to the cities or to neighboring countries, and left large numbers of children orphaned or abandoned. Inheritance. Tribes north of the Zambezi River follow a matrilineal model of inheritance. They trace their ancestry through the mother's side, and at marriage the man becomes part of the woman's family. In the south, the model is patrilineal. Kin Groups. South of the Zambezi River, tribes follow a patrilineal descent; to the north, kin ties are established through the mother's line. Infant Care. Young children rarely are separated from their mothers. It is customary for women to tie their babies to their backs with a strip of cloth and take them along when they work in the fields. Child Rearing and Education. Children are treated with affection but are expected to defer to their elders and often begin to work at a young age. After the civil war, as many as half a million children were left without families. Many of these children wander Maputo and other cities and stay alive by stealing or selling small items on the street. Relief organizations have alleviated the problem somewhat by caring for and educating children, and reuniting families. Because of the Portuguese legacy of suppressing education in colonies, Mozambique was estimated to have a literacy rate of only 10 percent when it gained independence in 1975. The first postindependence government made raising this number a priority and instituted compulsory education for children between the ages of six and twelve. This program was largely disrupted by the civil war. When the war ended in 1995, the literacy rate was 40 percent and only 60 percent of primary-school-age children were in school. Only 7 percent of children were enrolled at the secondary level. Since the peace treaties were signed, these numbers have begun increasing, but the destruction of many school buildings and a lack of trained and educated teachers have left the country with a problem that will not be soon eradicated. Higher Education. There are three institutes of higher education that enrolled a total of seven thousand students in 1995. Eduardo Mondlane in Maputo is the only university. Greetings are lengthy and involve inquiring into the health of each other's family. People generally stand close together and are physically affectionate. 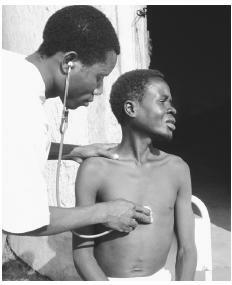 A doctor examining a TB patient in Morrumbala Hospital. The civil war took a heavy toll on medical care throughout the country. care and an education, as the colonial Portuguese government did not provide those things. Today the constitution ensures religious freedom and separation of church and state. However, when Frelimo took power, it expressed hostility toward Roman Catholicism, viewing it as a Portuguese tool of oppression. Twenty to 30 percent of the population is Christian, and 10 percent follows Islam; Islam is most prevalent near the northern coast. Many people who adhere to Christianity or Islam still practice traditional religion. About twothirds of the population follows animist rituals and customs. The traditional belief system places a high importance on a connection with one's ancestors as well as with the spirit world. Religious Practitioners. The animism practiced in Mozambique includes sorcerers, wise men and women, and witch doctors or traditional healers, who are capable of communicating with spirits and act as go-betweens for the rest of the people. The healers are well versed in the medicinal uses of local plants as well as spiritual healing. Rituals and Holy Places. Many animist rituals involve music and dance. For example, Makonde men perform a dance that involves large masks called mapicos. The masks are carved in secret, and represent demons; women are not allowed to touch them. The dance, which is performed to the accompaniment of drums and wind instruments, enacts a repeated attack on villagers by the demons and is a ritual that lasts for many hours. When independence was won in 1975, the government created a free, nationalized health care system, at the same time banning private practice; this resulted in an exodus by the majority of the country's doctors. The government's goal was to improve health through preventive medicine, employing nurses to give vaccinations and educate the population about sanitation and other basic health care measures. Many of the clinics it established, however, were destroyed in the civil war. Since the war ended, it has invested a large amount of money in rebuilding those clinics and has done away with the law prohibiting private practice in an effort to increase the number of doctors. A shortage of supplies and trained personnel was exacerbated by the destruction caused by the civil war. The main health threats are sleeping sickness, transmitted by the tsetse fly, and malaria. Life expectancy is forty-seven years for men and fifty years for women. The infant mortality rate is 130 per thousand, the highest in the world. Many people rely on traditional herbal medicines and healing methods under the guidance of village healers, in combination with what little health care and medicine the government provides. AIDS is a growing problem. In Maputo and the other urban centers, the infection rate is about 10 percent. Outside the cities, the rate is 17 percent for low-risk groups and 27 percent for high-risk groups. While these numbers are lower than those in some surrounding countries, AIDS is a major concern and a threat to the nation's future. The major holidays are New Year's Day on 1 January, Heroes' Day on 3 February, Women's Day on 7 April, Workers' Day on 1 May, Independence Day on 25 June, the Anniversary of the End of Armed Struggle on 7 September, the Anniversary of the Opening of Armed Struggle on 25 September, and Family Day on 25 December. Support for the Arts. There is a national performing arts company called the Nambu Productions as well as a national dance company, both of which perform contemporary productions based on traditional forms. The Frelimo government also established a National Institute of Culture that collects and preserves traditional music, crafts, stories, and myths. Literature. Literary production has been limited because of poverty and a low literacy rate. There is a strong oral tradition of storytelling, and many of the country's contemporary writers draw on that tradition. Literary writing has historically been tied to resistance to Portuguese colonialism and for this reason was largely censored before independence. Writers such as Luis Bernardo Honwana were imprisoned for their work. Honwana is also a documentary filmmaker but is best known for the book We Killed Mangy-Dog, which combines personal and cultural autobiography. Virtually all the poets and writers use the colonial Portuguese language as their medium. The poet Jose Craveirinha sees Portuguese, particularly with the infusion of local African words, as an important part of the nation's cultural heritage and is a proponent of retaining it as the national language. Because of a lack of education and other disadvantages, women have been underrepresented in the literary realm. One exception is Noemia De Sousa, who is known as the mother of Mozambican writers. When she began writing in the 1950s and 1960s, she was the only mestiça writing in Portuguese in Africa. She takes on the subject of African women and their work and has become a voice for the women of her country. Graphic Arts. Mozambique is known for the traditional sculpture and wood carving produced by the Makonde people in the north. Using hardwoods (primarily mahogany, ebony, and ironwood), the Makonde fashion masks and sculptures known as "family trees," large depictions of various figures that tell stories of generations. Mozambique also has produced several well known contemporary artists, including Malangatana Goenha Valente, whose large canvases depict conflict between colonial culture and native culture. Two contemporary sculptors are Nkatunga and Chissano. Performance Arts. The country has a long musical tradition. Song serves several purposes, including religious expression, the relating of current events, and making fun of neighbors. It is customary for musicians to make their own instruments.Drums have wooden bases covered with stretched animal skins. Wind instruments known as lupembe, used by the Makonde tribe, are made from animal horns, wood, or gourds. The marimba, a kind of xylophone that has been adopted in Western music, originated in Mozambique, where it is popular with the Chopi in the south. Chopi musicians also use the mbira, strips of metal attached to a hollow box and plucked with the fingers. The musical style is similar to West Indian calypso and reggae. A contemporary form of music called marrabenta has developed in the cities and draws on traditional complex rhythms. There are elaborate, well-developed traditions of dance throughout the country. Dances often have religious significance. The Chopi perform a hunting dance in which they dress in lion skins and monkey tails, carry spears and swords, and act out battles. Makua men in the north dance on two-foot-tall stilts, hopping around the village for hours, bedecked in colorful outfits and masks. On Moçambique Island, a form of dance practiced by women combines complex steps and rope jumping. Storytelling is another traditional art form. The national culture is rich in tales, proverbs, myths, and jokes that have been passed down from generation to generation. Facilities for the physical and social sciences are virtually nonexistent. However, Maputo has a Museum of Natural History that specializes in natural history and ethnography as well as the Freire de Andrade Museum for minerals and the History Museum for military affairs. The town of Ilha da Inhaca is home to a marine biology museum. Armon, Jeremy, and Dylan Hendrikson, eds. Mozambican Peace Process in Perspective, 1998. Bowen, Merle L. State against the Peasantry: Rural Struggles in Colonial and Postcolonial Mozambique, 2000. Chan, Stephen, and Moises Venancio. War and Peace in Mozambique, 1988. Ciment, James. 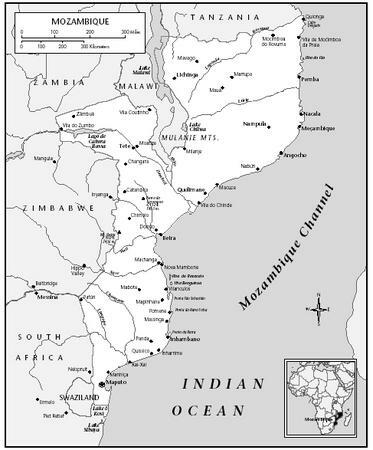 Angola and Mozambique: Postcolonial War in Southern Africa, 1997. Earle, Deborah, ed. From Conflict to Peace in a Changing World: Social Reconstruction in Times of Transition, 1998. Ferraz, Bernardo, and Barry Muslow. 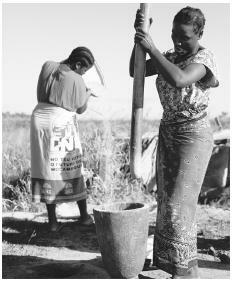 Sustainable Development in Mozambique, 2000. Hall, Margaret. Confronting Leviathan: Mozambique Since Independence, 1997. James, R. S. Mozambique, 1988. Landau, Luis. 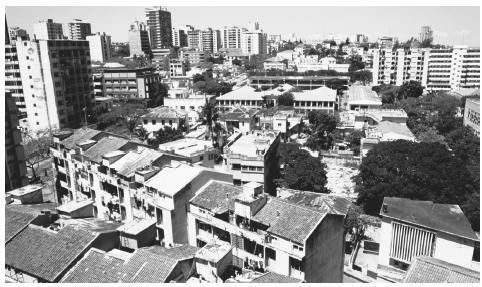 Rebuilding the Mozambique Economy: Assessment of a Development Partnership, 1998. Lopes, Armando Jorge. Language Policy: Principles and Problems, 1997. Newit, Mayn. A History of Mozambique, 1995. Nordstrom, Carolyn. A Different Kind of War Story, 1997. Reidy, Mary, ed. Mozambique, 1995. THE PICS ROCK I AM IN 6th grade and got stuck with mozambique and this site helped me alot!!!!!!!!!!!!!! Thanks! I'm a 7th grader doing a project on Mozambique, and this couldn't have been more helpful! I love all of the information your site has to offer! My class is doing a project on Mozambique and I got most of all my info. from this ! I would recommend this to everyone! Very cool details and pictures. You have everything you would need to research on this topic! I love it(: Keep up the good work! Thank you so very much! Hi, i am a student and we are working on Africa for social studies. Thank you for so much detailed information and awesome pictures. It really lighten up the pressure had for this Mozambique project. Thanks alot 4 the info on Mozambique.It helped out on my school projects! Thanks for such a great website!! We have to do a report on a Commonwealth country and i picked Mozambique and I thought it would be hard because they're aren't many good websites but this website helped me heaps!! thanks so much!! Went north of Beira in 2000 for a buff hunt. Had a great time and enjoyed the company of the greatest native staff I've had though 10 safaris. Thumbs up on all. I LIKE THE PICS & NICE AND CLEAR DISCRIPTION IS GIVEN. this is a very good article. i liked it alot. (: twas very helpful towards my project in my global studies class. so props to whoever put this together! Hi there, my name is Jess and I liked this web site but sadly it didnt have what i was looking for. I was trying to find some Mozambique tradions, customs and celebrations for a school project. Ps- I am 10-11 years old so the article should be simple and yet interesting. just like to share and comment on your spendid work on the project of mozambique. i havelway herd storesies of slavery and to my surprise a am a decendant of the slave trade of Northern mozambique, Nampula Nacala. i was born an bread in South Africa but my Roots have led me to the very place that slavetrade intensified in Nampula. i thank you again. Wow, that was a great article. I'm a 6th grader doing a projet on Mozambique. This really helped. Hi guys,this is appears to very insightful piece of research. Can somebody helpp me with the information about the traditional healers in Mozambique. You may just send their contacts,e-mails, etc or just direct me how i can get in touch with them. This site really helped me.i really like this site i will always use this site for everything. Hi i would like to know about my culture and their roots . I am stayong in South Africa and my grand father was born in mozambique . I do not know about our culrure , i only know that we are tjopi"s i am not sure if the speling is correct. I would realy appreciate if i can get much more info about them . My brother is getting merrid soon and we need to know our culture. Thanl you. wow,this website sure has a lot of facts. But i couldn't find anything about the tradition,canyou plz put some information about their tradition?thnx! Thank you so much! This helped me so much with my project about Mozambique! Thank you once again! The army in the specials forces COMANDOS . HOW i can find them if they are still alive ? VERY KNOWLEDGFULL AND HELPFUL TO UNDERSTAND ABOUT THE MOZAMBIQUE. MORE AND MORE EFFORTS ARE TO BE MADE FOR THE BASIC EDUCTION, HEALTH, AGRICULTURE AND TO MINIMIZE PRICE INCREASE SPECIALLY FOR FOOD & HEALTH TO ATTRACT PEOPLE OF MOZAMBIQUE TO WORK HARD FOR THE DEVELOPMENT OF THEIR MOTHERLAND. How many kilometers or hours of driving does it take from Cape Town to Maputo? Is the traffic left hand or right hand drive? e.g. like in South Africa? Can one ship cars, furniture etc from Mozambique to Europe? If so, what shipping companies should one contact in Maputo? Great job. More informative. Thanks a lot. Please keep updating. Pl add tourist spots with pictures. Again Thanks. Great blog. Thank you for posting this. The irony you discuss regarding national identity and language is fascinating. I am impressed by the contents of this website. It gives a good overview of Mozambique. I found it very infromative and answers most of the questions I have had for a long time about Mozambique. My father emigrated from Mozambique and settled in Zimbabwe in 1955. Can you shed more light for me on the traditional rituals during burial and after followed by the Sena people north of Zambezi? Who are the authors of this blog? I am doing some work/ assignment and have to research on Mozambique. I need to properly reference my work. Mindblowing history and culture. Beauty. Serenity and Peace. I just love reading about history. I found it to be very interesting, and would love to visit some day. The site was very useful and provided lot of information regarding Mozambique and their culture but I need some more information regarding the clothing. I wish to know the names of the cloths used by them, the name of traditional cloth, marriage costumes and name of the dress used during the traditional dances and functions. I love this but i just need to know what they wear in traditions and climates.